Probably one of the oldest and most familiar Ganesh festival songs in my memory with Mithunda, Amjad Khan, Danny and Vijayendra Ghatge in full on bhakti mood. Of course all through the song you know that there is something lurking behind all the innocence around. 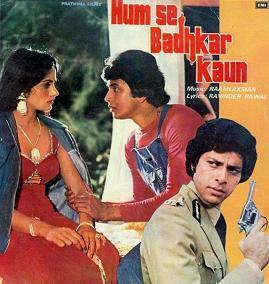 Humse Badkar Kaun is directed by Deepak Bahry and has music by Raamlaxman who was mainly popular for his association with Rajshri Films. This song is sung by Mohammed Rafi, Bhupinder Singh, Shailender Singh, Sapan Chakraborty and Asha Bhosle. The lyrics by Shailendra are simple yet very effective indeed. Probably one of the best ways of paying tribute to Ganesha the elephant God, this is a classic composition scored by none other than Ilaiyaraaja. 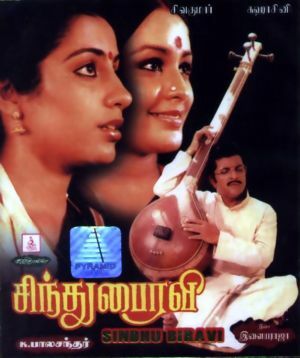 Sindhu Bhairavi is a musical and revolves around JKB ( Sivakumar ) a popular classical musician, his wife Bhairavi ( Sulakshana ) and Sindhu ( Suhasini ) a music enthusiast. Sivakumar was wonderful as JKB and Ilaiyaraaja knew that K.J.Yesudas would be the ideal person to render all the songs in the film and that’s what happened. I am sure this would rank among the finest songs sung by Yesudas so far in his very illustrious career. This song in particular is an original composition of the legendary Muthuswamy Dikishitar (lyrics also by him) and Ilaiyaraja had completely reworked the song keeping the original essence intact. The original Agneepath with Amitabh Bachchan in the lead and directed by Mukul Anand may not have been a musical, being the hard hitting film that it was. But the film did have a few good songs too composed by Laxmikant-Pyarelal and with lyrics by Anand Bakshi. This is a song which sees Amitabh taking the idol for visarjan and Mithun and Neelam singing and dancing side by side. Sung by Sudesh Bhosle, Kavita Krishnamurthy and Anupam Deshpande, the song also is used effectively to take the story along as seen in the background. Vaanmathi saw Ajith and filmmaker Agathiyan unite for the first time ( they later worked together on the critically and commercially successful Kadhal Kottai ). A typical poor boy meets rich girl story with the rich girl’s mother not liking the boy, the film turned out to be a surprise hit. The song is composed and sung by Deva who used to be a very prolific composer in Tamil Cinema in the 90’s. While it’s a known fact that Deva used to plagiarize a lot of work it also has to be admitted that when it came to composing “ gaana” songs he was wonderful. This is a tribute to Ganesha done in typical gaana style. The lyrics by Vaali are simple yet effective. Amarkalam is Tamil filmmaker Saran’s 2nd film and incidentally like his 1st film Kadhal Mannan , here too he worked with Ajith. A major part of the film was shot in Srinivasa Theatre, Chennai and this song too is a celebration of Ganesh Chaturthi inside the theatre compound. The song highlights Raghava Lawrence who in those days was a choreographer and featured in some of his own songs before he eventually turned actor-director. Composed and sung by Bharathwaj (who has worked with Saran on almost all his films), the lyrics by Vairamuthu and quite catchy. In a film where probably the only sore note was the overdose of in film placements, this song is a good indicator of the film having some good elements in its favour. 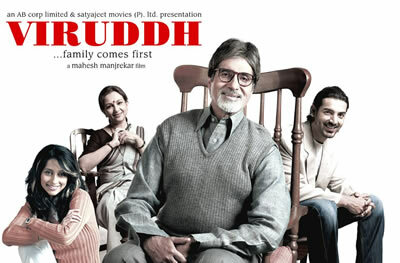 While Viruddh directed by Mahesh Manjrekar does have shades of Mahesh Bhatt’s Saaransh, but Amitabh’s portrayal of the distressed father in Viruddh is done in a way that’s quite different from that of Anupam Kher’s in Saaransh. This song sung wonderfully by Shankar Mahadevan is composed and written by Ajay-Atul and is a wonderful tribute to Lord Ganesha. 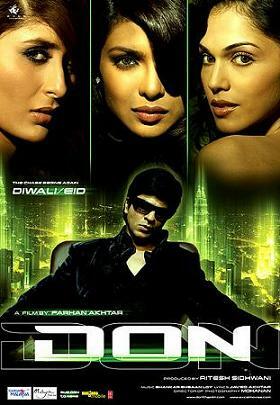 This song from Farhan Akhtar’s retelling of the orginal Amitabh starrer Don is still very popular and one of the favorites during the Ganpati season. SRK as Vijay is very much in his elements as he performs during this song sung effortlessly by Shankar Mahadevan. Composed by Shankar-Ehasaan-Loy and written by Javed Akhtar, this song is again tracing the journey of the idol during the visarjan ( immersion ) ceremony. Singer –composer Avadhoot Gupte turned filmmaker with the Marathi film Zenda which was based on politics in Maharashtra and depicted a rivalry between two cousins belonging to 2 different political parties (kind of similar to the real life between Raj Thackeray and Uddhav Thackeray).Morya is Avadhoot’s 2nd film as director and has an interesting premise. Centred around the Ganesh festival in Mumbai which is a big annual ritual in the metro, there is a lot of rivalry among certain groups involved in organizing the pandals. Morya talks about 2 such groups in a chawl during the festival. Hey Lambodar is an innovative Ganesh song composed by and sung in Qawwali style. Composed by Avadhoot Gupte and sung by Farid Sabri and Avadhoot Gupte this was quite a popular song last year. Another song from Morya, this one is the title song and also gives you a glimpse of the fervor and frenzy that the festival brings into the city of Mumbai. This is the current season favorite I guess being the most recent among all the Ganesha songs. Composed by Ajay-Atul and written by Amitabh Bhattacharya, the song is sung by Ajay Gogavale (of the Ajay-Atul duo) while sounding quite similar to Sukhwinder Singh. Hrithik Roshan looks quite intense in the song and it’s quite a short and sweet composition. These are some of my favorite and popular Ganpati songs that immediately come to my mind whenever I think of Ganesh Chaturthi. So what would be your personal favorites out of these and many more across languages? ← Easan Movie Review: There’s light at the end of this tunnel !!! i like this one too.. more of a puja (aarti) than a song sequence.. interestingly mixed with the encounter’s of sanjay dutt’s accomplices..
Ah!Souvik I like this one too & was almost about to include it in my list but when I looked close enough I realized that contrary to what we have been thinking the Aarti here is actually an Aarti to Devi & not Ganeshji ( you’ll have to look carefully towards the end of the video ). hahaha yes you are correct. Why dint someone burn the negative of that pathetic film.